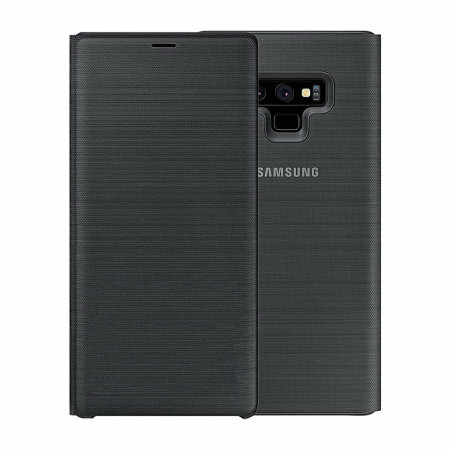 Protect your Samsung Galaxy Note 9 screen from harm and keep up to date with your notifications through the intuitive LED display with the official black LED cover from Samsung. Good protection to the phone and the led display on the cover is fun. Very Good, effective and smart cover. This is a very good cover and I wanted led display and wireless charging too, which is there in this cover. Also the finish and look of the cover is good. Only thing is, it would've been good if it could've incorporated kick stand too and when we do wireless charging, it does not show LED display. Very Good and effective cover. This is a very good cover and I wanted led display and wireless charging too, which is there in this cover. Case fits well. It has no magnet closure , which , on the note 9 is understandable because magnets interfere with the screen, but it would be better if it had a velcro or some other non magnetic closure system. The LED screen on the front is very nice feature . Really happy with it, works really well. Great case. Clever features. Easy to use. I really like flip cases as I feel these protect my phone well, and look great. The material finish is nice and of a high quality. The notification LEDs and icons are really helpful and the touch controls for music are fantastic. It's not cheap, but it's by far the best cover case for your Samsung Note 9. Brilliant design. Love the readout. Great cover case with cool LED functionalities. The cover is a hard solid clam shell type and surprisingly it does not increase the thickness of the phone by much. The led is great also when you play music with the cover closed the led lights up to the beats of the music like a digital equalizer. She really likes her cover case. I just wished the information were more transparent because I would have like to have purchased the purple one for my wife. I owned one of these covers for my Samsung Galaxy s8+ and the cover stopped working after about 6 months of use, just general wear and tear I think. Well when I got the note9 I thought I might aswell get another one of these covers because I really enjoyed the previous one i had for the s8+. I was expecting something pretty much the same, well I was wrong! They have improved the cover alot. The outside is like a textured soft plastic which makes it really easy to wipe off where as the previous one was like a fabric so it always looked a bit dirty. This cover protects the phone alot more and being sturdy i doubt ill have the same issue with it stopping working. With this cover the LED display is coloured! Where as the previous one wasn't. I had an issue this morning while charging from one of those battery pack things for your car, and I was using hot spot and Spotify all the same time so the LED display wasn't showing up, but once I restarted the phone it was fine so guessing it was an issue with the phone and not the cover. overall though I am absolutely satisfied! I have the lavender cover on my note9 and it looks great even though the colours aren't matched. I give this a 9/10! First time Product not came. but second time send.. I like the feel of it, the course and how it fits. But the digital screen doesnt stay on, it's only there for s brief moment. It doesnt stay closed well. I bought one for my Galaxy S9+. I really love the features and ease of use. This year's LED cover is a significant improvement over the same product Samsung launched for the Note 8 last year. The material used looks and feels much higher quality than last year and it doesn't get fingerprints on it like last years. The case design and fit has improved. It's more sturdy, fits better and the screen cover part of the wallet covers the screen fully, including the edge panel. They have added colour options into the LED display this year. I really love this case. Fit perfectly and the led light is a fun feature. A very good phone cover that still allows access to the fingerprint scanner, pen and cams. It has great protection where its needed. Its a Samsung phone cover for Note 9 and does what's intended. Nice good tough looking cover. LED is telling what is happenning shortly without opening the cover. Love this case works great with my new phone and looks good in blue. Just put my phone in and it worked straight away didn't have to do anything. It would be helpful to know that this case does not support wireless charging as the back is too thick. Apart from that it is a good but expensive buy. In our experience, the official cases from Samsung support wireless charging very well. Can you please contact our Customer Services team so we can look into this for you - also confirming which wireless charging unit you are using as this can also have an impact on how well the phone chargers wirelessly with a case attached. Your website made it pretty clear as far as what I should expect. There were no surprises, it was exactly as it was portrayed. I love this cover and would gladly recommend it to my family and friends. The case protects the phone well and the display is amazing. It is touch sensitive as well as being informative. It still fits in my pocket and I know the phone is well protected. Exactly what I expected from mobile fun, every time I get a new phone I buy a new case always from mobile fun and never been dissapointed. This was a genuine case to fit my phone, I'm fully satisfied.